Latest Job Vacancies in Dubai Expo 2020. The Dubai Expo 2020 will be the first event of its kind to be held in the Arab world, and as such, it is set to be an extremely prestigious event. 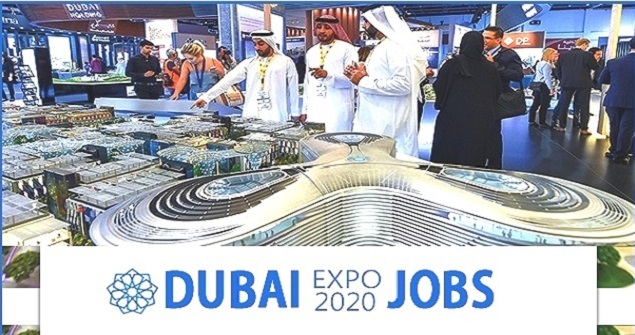 Although the Expo will bring the attention of the world firmly to rest on the UAE, it also presents many excellent opportunities to those who are looking for job opportunities in Dubai, since it has been suggested that the Expo will create around 200,000 vacancies which need to be filled before the event kicks off in three years time. If you are interested in the latest job vacancies in Dubai Expo 2020, you will be interested to note that, despite the fact that the event will not be held for several more years, vacancies are already opening up, and this summer saw several positions already being filled. The positions which have already become available range across all levels, with posts such as drivers being available for those who are just starting on the career ladder and managerial positions for those with considerable experience. However, the majority of job openings for the event at the present time are not for those who are looking for entry level jobs but for those who are already at either an association or senior level in their career. If you are interested in working as part of the team behind this exciting event, the first place to begin your search for a job is on the Dubai Expo 2020 website itself. There is a dedicated careers section where you can find out more about the various positions being advertised and make your application online. There are also positions being advertised on other external general job listing websites such as GulfTalent.com. The variety of posts available with Dubai Expo 2020 is quite broad, however many posts have already been filled across the supply chain, ICT, procurement and commercial sectors. The website's advanced job search allows candidates to search by several different criteria including location, salary, job type, career level and keyword, however most of the positions currently advertised are at a mid to senior level. This may change in the future, however, with more entry level posts opening up at a later date, and a wider range of career types opening up. You can apply for the latest job vacancies in Dubai Expo 2020 through the event's own website itself. You can register for an applicant account by completing your own personal details and uploading your latest resume and then you are free to apply for whichever posts you are interested in. Alternatively, you can simply submit your CV for consideration to the recruitment team and they can match you to any vacancy which they feel is suited to your existing skills and experience. Once you have been matched to a post, you will be invited to interview, and if successful, will be offered a position. The Dubai Expo 2020 also offers an apprenticeship and training program which is aimed at helping graduates to widen their professional experience. With an integrated program with the Jebel Ali Free Zone's Tumoohi scheme, UAE nationals are able to benefit from an enhanced program with apprenticeship options to boost their career that combine academic study with expertise and knowledge derived in an on-the-job environment.